PST repair without scanpst. Repair PST files easily. 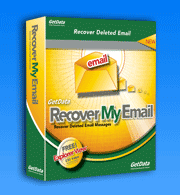 Recover My Email is mail recovery software that can recover deleted email messages from either your Microsoft Outlook PST file or your Microsoft Outlook Express DBX files. Mail recovery for deleted email in Outlook 98, 2002, 2003, 2007, 2010*. More effective than the scanpst Inbox Repair Tool. See the email recovery before you decide to purchase. Mail recovery for Outlook .PST files with the 2GB size limit problem. Download and try Recover My Email now, and give PST Repair a try today. Use the evaluation version to fully preview email recovery results including message attachments. Once you activate the program, quickly save an error free copy of your lost, deleted, or corrupt email messages. Recover deleted email messages and attachments from your Personal Storage File (PST). Save mail recovery results, including messages contacts and attachments in an error free new PST file with full folder structure. Open and read corrupt Outlook PST files and recover email and attachments. Recover deleted email messages and attachments from your individual Outlook Express DBX files. Save the email recovery messages and attachments and import them back into Outlook Express. Recover My email will quickly and easily recover messages or deleted email attachments from your Microsoft mail box. No technical skill is required for this recovery software email. You do not need Microsoft Outlook or Microsoft Outlook Express installed to use this mail recovery software. Just open and process the file, preview the recovered email messages and attachments, and save the results. Click the Download Now button and save the RecoverMyEmail-Setup.exe installation program to your computer. Once saved, run this file to install the program. Once installed, run the program and open you problem email file. 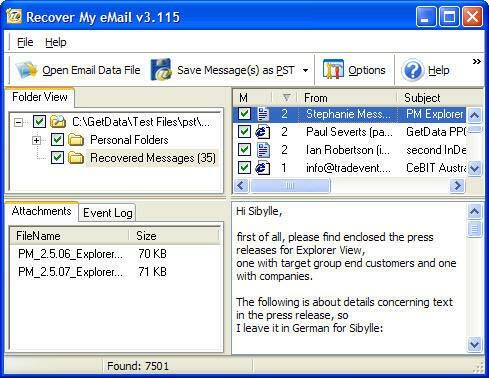 Process the email file and view the email recovery results. To save your email purchase an Activation Key to activate the save feature of Recover My Email. NOTE: If you have deleted your entire Microsoft Outlook PST file or your Microsoft Outlook DBX files you need to instead use Recover My Files Data Recovery Software to recover these files.